The Edison State men’s and women’s basketball teams will take record of 17-4 overall and 6-3 in the OCCAC into Wednesday night’s game at Hocking College after a double weekend of OCCAC action. The Edison State men’s team swept Columbus State and Lakeland over the weekend. On Saturday, the Chargers defeated Columbus State 80-75. Edison trailed 40-39 at halftime before rallyng for an 80-75 win. Columbus State dropped to 11-6 overall and 8-2 in the OCCAC. Lacey Watson led ESCC with 24 points, nine rebounds and four assists. Dakota Prichard had 17 points, eight rebounds and two steals, while James Richardson Jr. had 16 points , three assists and eight rebounds. Lamine Komara had 10 points, seven rebounds and two steals, while Sean Jones ghad nne points, nine rebounds and had three assists. Corey Baker had 17 points and eight rebounds for Columbus State, while Charles Aden scored 16 points and Shawn Hawkins added 13 points and five rebounds.Melieck Evans scored 12 points, Keshawn Underwood grabbed 10 rebounds and Jeremiah Green had eight points and eight rebounds. ESCC was 23 of 64 from the floor for 36 percent, including 10 of 34 from 3-point range for 29 percent. The Chargers made 24 of 39 free throws for 62 percent. CSCC was 30 of 66 from the floor for 46 percent, four of 12 from long range for 33 percent and 11 of 17 from the line for 65 percent. CSCC won the battle of the boards 48-45, but had 18 turnovers to Edison State’s 15. The Chargers followed that with a 79-72 win over Lakeland. That loss dropped Lakeland to 16-5 overall and 6-3 in the OCCAC. ESCC led 35-32 at halftime and held on for the win. Prichard had 16 points and seven rebounds, Richardson Jr. scored 12 points, Jaedyn Carter had 10 points and six rebounds. Komara and Jones both scored seven points. Rob Brown had 14 points and 10 rebounds for Lakeland, while John Dawson had 14 points and three steals. Chandler Fointno no and Isaiah Washington both scored 11 points, Jonny Bowers scored eight points and Cory Fulton dished out five assists. ESCC was 27 of 58 from the floor for 47 percent, including nine of 18 from 3-point range for 50 percent. The Chargers converted 16 of 28 free throws for 57 percent. Lakeland was 26 of 61 from the floor for 43 percent, including seven of 29 from long range for 24 percent. The Lakers made 13 of 16 free throws for 81 percent. Lakeland won the battle of the boards 38-37 and had 15 turnovers to Edison State’s 15. The Edison State women split two games. 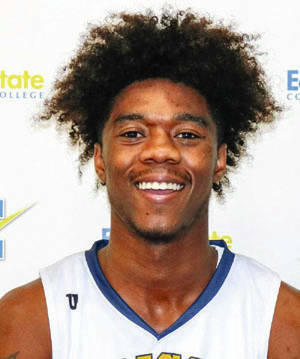 On Saturday, ESCC defeated Columbus State 76-58. The Chargers led 25-16, 43-34 and 59-50 at the quarter breaks. Columbus State dropped to 5-12 overall and 4-6 in the OCCAC with the loss. 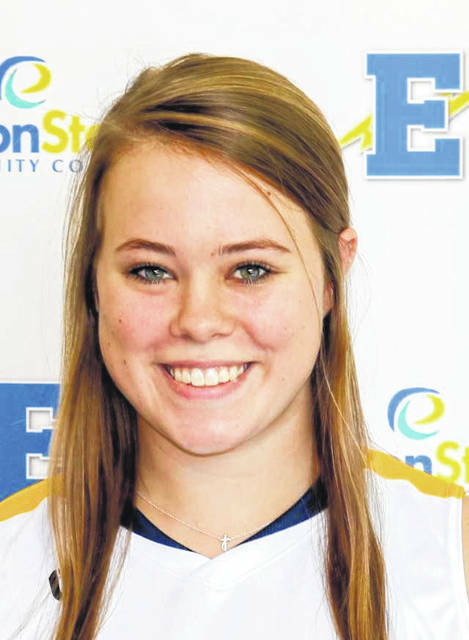 Clair Schmitmeyer filled out the stat sheet for ESCC with 19 points, seven rebounds, six assists and eight steals. Kailani Broyles added 16 points and five steals, while Sarah Pothast had 15 points and five rebounds. Kennadie Reese had 11 rebounds and five assists, while Lauryn Gray grabbed six rebounds. Whitney Staggs had 21 points and 13 rebounds for Columbus State. Melia Walder and Saraysia Nelson both scored eight points. ESCC was 31 of 69 from the floor for 45 percent, including two of seven from 3-point range for 29 percent. The Chargers were 12 of 15 from the line for 80 percent. CSCC was 22 of 66 from the floor for 33 percent, two of 12 from long range for 17 percent and 12 of 20 from the line for 60 percent. The Chargers won the battle of the boards 47-41 and had 25 turnovers to CSCC’s 26. Edison State lost to Lakeland 68-60 Sunday. The Lakers led 15-14, 36-26 and 54-44 at the quarter breaks. Lakeland improved to 15-8 overall and 8-1 in the OCCAC with the win. Pothast had 24 points and nine rebounds for ESCC, while Kaylesha Broyles had nine points and six assists. Kennedie Reese had eight points and five rebounds, while Elysabette Andrews grabbed 12 rebounds. Schmitmeyer had seven points and eight rebounds and Gray added eight rebounds and three assists. Selah Richardson had 19 points, seven rebounds, four assists and six steals for Lakeland. Delesha Jackson had 18 points, five rebounds, six assists and nine steals; while Alicia Sephus had 16 points and five rebounds. Destiny Khay had nine points and Ziona Williams had seven rebounds and six assists. ESCC was 21 of 60 from the floor for 35 percent, missed all four of its 3-point attempts and made 18 of 29 free throws for 62 percent. Lakeland was 28 of 73 from the floor for 38 percent, five of 28 from long range for 18 percent and seven of 17 from the line for 41 percent. Edison State won the battle of the boards 60-37, but had 41 turnovers to Lakeland’s 27.